Common carp are one of the world's most invasive and ecologically damaging fish. While research has identified some management strategies, the current options are expensive, can have limited effectiveness and come with non-target impacts. 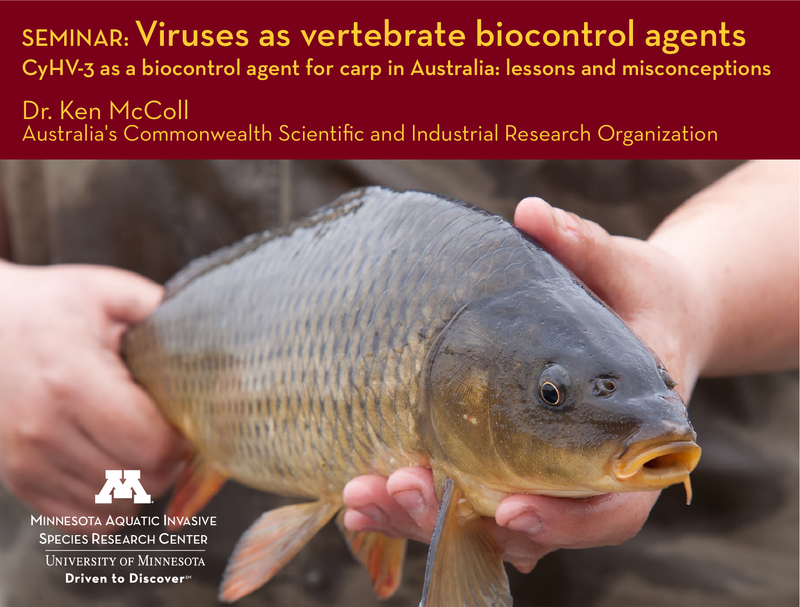 A new approach using viruses as a biocontrol agent for carp is gaining traction in Australia and the subject of ongoing research in Minnesota. The lead researcher for the Australian effort, Dr. Ken McColl, will be here May 3 to present on his work. This event is presented by the Minnesota Aquatic Invasive Species Center and co-sponsored by CAHFS. Dr. McColl is a principal research veterinarian at the high-security CSIRO–Australian Animal Health Laboratory in Geelong, Australia. McColl has worked on rabbit haemorrhagic disease virus as a biocontrol agent for rabbits, and he now leads a group investigating the use of koi herpesvirus as a potential biocontrol agent for carp.